This 2010 draft survey on global challenges is to be reviewed by experts. Your suggestions are welcome, please use the contact form. 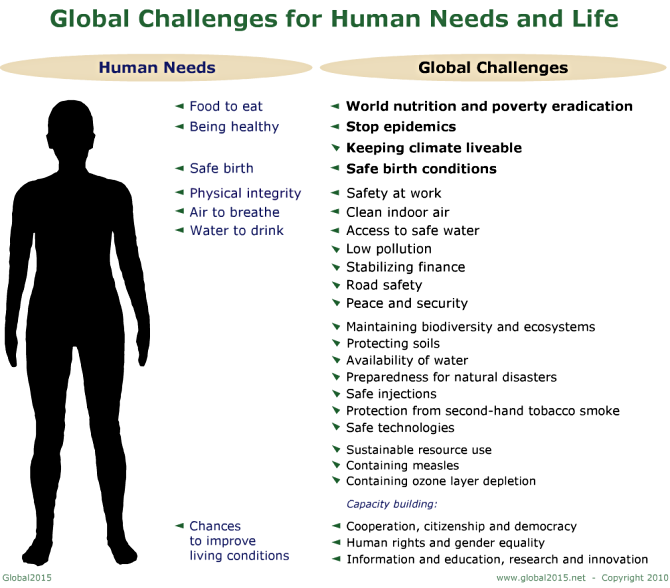 This survey gives an overview of the most urgent global challenges to human needs and life. All these challenges are of vital importance for human life, since they deal with overcoming or reducing large-scale damage that has already been caused and/or reducing risks that affect many people. The challenges addressed originate mainly from man-made causes – less as a result of individual actions but rather due to larger-scale human activities. The global challenges have been weighed and prioritized as far as available data and risk assessments allow. They are considered with regard to the questions: Are they being given enough attention? Are efforts being made to overcome them? For selecting and weighing the challenges, indicators are used which relate to: damages and risks to life and health, economic and social development, and the natural resources on which human life depends. Data, risk assessments, goals, targets and recommended measures are all taken from trusted sources such as scientific institutions, UN (United Nations) organizations, national administrations, and unaffiliated foundations. Due to data quality and availability issues, the order of challenges described below should not be seen as a strict hierarchy. In particular, some challenges characterized primarily by risks may be underestimated due to lack of available data. It should be noted that this survey does not attempt to give a complete description of all global challenges or the state of the world. Instead it identifies only the most urgent. This does not mean that challenges not addressed here are irrelevant or negligible. Furthermore, this survey seeks a global perspective, rather than limiting it to particular countries or groups of countries. Within this survey the various connections and overlapping of the global challenges are only indicated rather than explored fully. They are described more precisely in the separate pages on each specific global challenge. This information is available in the previous version of the survey, which is currently in the process of being updated. Although many of these challenges seem too daunting for people to become involved in, progress has already been made; and some other severe problems have already been solved. All progress towards saving human lives, improving health and protecting other basic requirements for our existence is worth the effort. Although there is enough food to feed every person on the planet, the number of people suffering from chronic hunger has risen to between 915 million and 1.02 billion. As a result, approximately 3.5 to 5 million people die per year. The death toll of the worst famine in human history claimed 20 to 40 million lives. 141 million healthy life-years (DALYs, disability-adjusted life-years) are lost each year as a result of premature deaths and disability. Medical expenditure as a result of malnutrition costs roughly 30 billion dollars per year. One of the main causes is extreme poverty, which has increased to now include 1.4 billion people living below the extreme poverty line of $1.25 per day. The financial crisis will leave an additional 64 million people in extreme poverty by the end of 2010. The members of the United Nations have agreed upon targets to halve the proportions of undernourished and extremely poor people, from 1990 to 2015. In order to reach the target to halve undernutrition, $ (dollar [United States])30 billion is needed each year. Recommended measures include: school meal programmes, food for work projects, providing access to productive resources such as land, water, seeds, knowledge, and microcredit, as well as policies that counter the negative effects of higher food prices. The number of people suffering from HIV (Human Immunodeficiency Virus)/AIDS (Acquired Immune Deficiency Syndrome) has risen to about 33.4 million. Around 11.1 million people are ill from tuberculosis (TB), and 243 million from malaria. Together, these diseases kill around 4.2 million people per year, showing a decrease. These three diseases together account for an annual loss of 58.5-127 million healthy life-years (DALYs). There are also global risks from drug resistant diseases and new diseases, with a potential to cause severe damage to humankind – though the probability of its occurrence remains uncertain. At present, an event similar to the 1918 Spanish flu pandemic could result in over 100 million deaths and economic losses of about 3.1% of world gross product. Annually, HIV/AIDS causes losses of 2-4% of GDP [gross domestic product] in many affected countries, TB $12 billion in the poorest countries, and malaria $12 billion in Africa. The UN targets a halt in the spread of HIV/AIDS, malaria, and other major infectious diseases, by 2015. Providing public information and antiretroviral therapy against HIV/AIDS requires at least $25 billion in 2010. Further measures consist of safe practices in injections and blood transfusions, anti-malaria bed nets, insecticide use, improved case detection and the introduction of new treatments. Man-made climate change is likely to include weather extremes and global warming of 1.1-6.4°C (degree Celsius) by 2100 – harming agriculture, biodiversity, freshwater resources, coastal zones, human health, and many other areas. Climate change already affects around 325 million people, and is likely to increase up to 660 million affected by 2030. Around 141 000 to 315 000 annual deaths are attributed to climate change, potentially amounting to a total of 182 million deaths by the end of this century. Currently, around 5.4 million healthy life-years (DALYs) are lost annually due to premature deaths and disability resulting from climate change. The cost of diseases and disasters related to climate change is estimated to be $126 billion per year, and including long-term damages the figure rises to approximately $1.35 trillion per year (2% of gross world product). The losses could rise in the future to 5-23% of per-capita consumption. Linear climate change is a risk with quite a high extent of potential damage and quite a high probability of occurence; non-linear changes have a higher extent of damage but an unknown probability. There are 40 industrialized countries and countries in transition that have agreed to reduce their greenhouse gas emissions by 5% from 1990 levels, by 2012. Although they have achieved this on average, global emissions have still increased by 24.4%. Efforts to mitigate and adapt to climate change should be intensified, such as: strengthening energy efficiency, energy saving technologies and practices, renewable energy sources, emissions trading or a carbon/energy tax, additional tax on air travel, forest preservation and afforestation, environmentally sound agricultural practices, technology transfer, protection of coastal zones, and public health care. 3.5 to 4.5 million infant and maternal deaths occur each year and 34% of deliveries take place without the assistance of skilled attendants (a decrease from previous years). The losses in economic development due to the financial crisis are projected to result in the deaths of an additional 265 000 infants, between 2009 and 2015. At present, 300 million women are suffering from illness brought about by pregnancy or childbirth in unsafe conditions. About 126-165 million healthy life-years (DALYs) are lost annually. The UN members have set targets to reduce the mortality rate of children under the age of 5 by two thirds and the maternal mortality rate by three quarters from 1990 levels, by 2015. Furthermore, the UN has agreed to strive for universal access to reproductive health and family planning. Comprehensive measures to reduce child mortality would require about $52.4 billion. Measures include providing more visits from a trained health-care practitioner during the course of pregnancy, skilled birth attendance, emergency obstetric care, postnatal care, and access to family planning. There are about 268 million occupational accidents and 160 million victims of work-related illnesses each year. The number of people who die from work-related diseases or accidents has risen to between 457 000 and 987 000, or even 2.3 million annually. The burden of disease amounts to 11.6-25.6 million lost healthy life-years annually (DALYs). Resulting economic costs amount to roughly 4% of gross world product (global GDP/GNP [gross national product]). There is no international target, but there are international labour standards on occupational safety agreed upon by the ILO [International Labour Organization]. Occupational cancers are entirely preventable through hygiene measures, substitution of safer materials, enclosure of processes, and ventilation. Traditional prevention and control measures should be applied to hazardous chemicals, machinery and tools, manual handling, and biological agents. However these need to be complemented with strategies and tools designed to deal with risks arising from new technologies. An increasing number, currently around 1.97 million people (mainly women and children), die each year from respiratory diseases resulting from indoor air pollution. This is mainly due to cooking inside with an open fire and could be seen predominantly as a result of lack of access to modern energy sources. The number of people who live in such households has increased to about 3.1 billion. This results in the loss of 41.0 million healthy life-years (DALYs) annually. The WHO air quality guideline for respirable particulate matter with a diameter less than 10 micrometres (PM10) applies also to indoor air pollution. Investing $13 billion per year would halve the number of people worldwide cooking with solid fuels by 2015. Measures include providing households with clean fuels or improved stoves, the installation of a hood or chimney, and home insulation for more efficient heating. About 884 million people do not have access to hygienic water (though this is decreasing in the long-term) and 2.6 billion are missing basic water sanitation (increase from previous figures). This is the main cause of around 4.6 billion cases of disease, and it is resulting in about 1.91 million deaths annually, mostly children. It also leads to the loss of about 64.2 million healthy life-years (DALYs) annually. Due to the financial crisis, it is projected that an additional 100 million people will lack access to clean water by 2015. The UN members agreed to halve – from 1990 to 2015 – the proportion of people lacking access to safe drinking water, as well as the proportion of those having no access to basic sanitation. To achieve these targets, $11.3 billion per year is needed. However, this investment has the potential to gain $84 billion in annual benefits. Measures range from hygiene education and disinfection at the point of consumption, up to providing basic sanitation facilities, collecting rainwater, providing public taps and/or connecting households to piped water. About 1.84 billion of the global urban population are exposed to levels of particulate air pollutants above the international health related guideline for PM10 (particulate matter less than 10 micrometres in diameter). 1.15 million people die each year as a result of urban air pollution. In 2030, 3.1 million people may die because of airborne particles. Currently, around 9.60 million life-years are lost annually due to premature deaths (YLL [years of life lost]). The cost of the damage caused by air pollution in the USA (United States of America) is about $74.3 billion. The risks from persistent organic pollutants and hormonally active substances are uncertain, but they remain in the environment for a long time. The UN members aim to minimize the adverse effects of chemicals by 2020 and support the safe management of chemicals in the Global South. Suggested measures include: filtering or reduction of emmissions from vehicles, power plants, and industry; switching to renewable energy; traffic reduction, expansion of public transport and bicycle traffic; safer chemicals and safeguarding against toxic substances. Since 1970, financial crises have increased and have resulted in fiscal costs over the 1980s and 1990s of more than $1 trillion. Over 2007-2009, the worst financial crisis since 1929 occured. To prevent a breakdown in the global economy, governments intervened with guarantees, loans and capital shares of some $20 trillion. Fiscal stimuli of around $2.6 trillion were spent. Nonetheless, after the financial crisis the world's economic output is still 7% lower, relative to a no-crisis scenario. The crisis will leave an additional 64 million people in extreme poverty by the end of 2010. The losses in economic development due to the crisis are projected to result in the deaths of an additional 265 000 infants and 1.2 million children under the age of 5, between 2009 and 2015. There was an estimated increase of almost 34 million unemployed since 2007, and in 2009 alone, an additional 41.6 to 109.5 million workers were in vulnerable employment as a result of the financial crisis. The potential scale of market risk in derivatives transactions has amounted to $21.6 trillion in outstanding gross market values. Countries of the Global South are $2.7 trillion in debt to industrialized countries. The debt service paid by less developed countries has almost halved to 3.5% of their exports of goods and services. Efforts to reduce risks include a far-sighted regulation of financial markets (regarding transparency, equity, risk management etc. [and so on]), better international cooperation and curbing global account imbalances. The UN has been striving for debt relief packages, which have cumulated to $82 billion in 2010. About 24.3 million people are injured or disabled, and 1.27 million people die in road traffic accidents each year. A resultant loss of 41.2 million healthy life-years (DALYs) occurs annually. The global economic costs of road crashes have been estimated at 1-2% of gross world product annually. Sufficient and safe transport capacity is required to tackle this and other global challenges. The annual number of deaths resulting from road traffic accidents are projected to double to 2.4 million by 2030. There is no international target, but a global ministerial conference suggested a target to stabilize and then reduce the forecasted level of global road deaths by 2020. 75 countries have already set targets. Measures to improve road safety include: safe road and vehicle design, traffic management, seat belts, helmets, day-time running lights, speed limits, restrictions on drinking and driving, and improved post-crash care. Between 172 000 and 310 000 people are killed per year by violence in recent armed conflicts, although the number is decreasing. Within the 20th century, there were about 191 million deaths as a result of armed conflicts. About 27.1 million people are displaced within their own country because of armed conflict, situations of general violence or violations of human rights. About 7.38 million healthy life-years (DALYs) are lost annually because of wars and armed conflicts. Economic damages due to armed conflicts are estimated to be $1 trillion per year. With the advent of weapons of mass destruction, the danger of man-made devastation of mankind exists. Production and storage of NBC (nuclear, biological and chemical) weapons as well as nuclear weapon early-warning systems, pose similar risks as those presented by nuclear energy facilities and large chemical facilities, but with varying probability of occurrence. The UN has demanded the disarmament of weapons of mass destruction and some treaties stipulate a ban on chemical and biological weapons, as well as the proliferation of nuclear weapons. However, the implementation of these restrictions poses a considerable problem. Measures include: the prevention of armed conflicts through support of non-violent conflict resolutions; limiting the effects and the occurrence of armed conflicts by public international law; arms control and disarmament. Activities to reach a world free of nuclear weapons have been strengthened considerably. Only two of the fourteen indicators for biodiversity, which is essential for the ecosystem's stability, have shown a positive trend in recent years. The Living Planet Index points out a 31% decline of species abundance since 1970. Invasive species cause economic losses of $336 billion to $1.4 trillion per year. Ecosystems are also overstressed by deforestation and overfishing. The net loss of forests has decreased in recent decades to 5.2 million hectares annually. However, each year, illegal logging causes losses in assets, revenue and royalties of more than $15 billion. Deforestation affects the climate and could thereby lead to global economic costs of $60 billion per year. More than 75% of fish stocks are fully or over-exploited and are therefore underperforming due to inefficiency, at an estimated annual loss of $51 billion. The global risks from ecosystem destabilization and anthropogenic affects on mass developments of species have a high potential for damage, with high resp. unknown probabilities of occurrence. The UN members missed their target to significantly reduce the rate of loss of biodiversity by 2010 and are striving to reverse the loss of forest cover worldwide. Measures include: establishing more protected areas and improving existing ones; using more environmentally sound methods in agriculture; storing seeds and genes; protecting species threatened by extinction; supervising and restricting trade of illegally harvested timber; setting standards for intensity of logging and fishing; addressing consumption patterns; providing appropriate pricing and incentives; payments for ecosystem services; eco-certification; and creating opportunities for rural enterprises, farmers and local communities based on the maintenance of biodiversity and ecosystems. Soils enable the production of more than nine tenths of all food. More than 1.2 billion people and 12-29% of the global land area are already affected by soil degradation. Moreover, large areas of arable land are at risk of being turned into steppe or deserts. Major causes are overgrazing, intensive or inappropriate methods of agriculture, and deforestation. The large-scale extraction and transfers of nutrients and virtual water embedded in feed and animal products may lead to serious lasting consequences for ecosystems and soil fertility. The UN has agreed on a goal to combat desertification and mitigate the effects of drought. The UNCCD (United Nations Convention to Combat Desertification) has initiated various action programmes on a regional and national level. Suitable plantings can improve the quality of soils. The number of people living in areas of physical water scarcity has risen to more than 1.2 billion. They lack sufficient water for food production, health, and development. Between 5% to 25% of global freshwater use likely exceeds long-term accessible supply and the global average water quality is declining, too. The frequency of water-related conflicts has increased. By 2025, it is estimated that 3.5 billion people will live in water scarce or water stressed areas. The UN members have agreed to stop the unsustainable exploitation of water resources by developing water management strategies. Such measures include better allocation of water to different water user groups, integration of water supply and use with the management of waste, sewage and groundwater protection, reducing leakage losses in storage, drainage and irrigation systems, rain water harvesting and recycling of waste water to increase agricultural water efficiency, and fostering cross-border co-operation in the management of shared water resources. Annually, over the last ten years, roughly 269 million people (4.24% of the world's population) are affected by natural disasters, with an increased annual average of 115 000 people dying as a result. Exceptionally, the devastating earthquake in Haiti in 2010 killed over 223 000 people. The deadliest natural disaster in recorded history, the flood of the Huang He (Yellow river), resulted in 850 000 to 4 million casualties. Economic losses from natural catastrophes total around $107 billion per year and have increased roughly five-fold since the 1970s. While there is no international target, the UN has started the International Strategy for Disaster Reduction, with the goal of reducing human, social, economic and environmental losses due to natural hazards and related technological and environmental disasters. Measures consist of: building disaster resilient communities, enhancing awareness, implementing regulations on the earthquake-proof construction of buildings, limiting settlements in risk areas, providing natural floodwater storage and dams to limit floods, early warning systems, preparing and providing emergency relief and health care, and support for the subsequent reconstruction, if needed. Annually, between 417 000 and 1.3 million deaths are caused by unsafe injection practices in medical practices. About 6% of the world population each year receive injections contaminated with hepatitis B (hepatitis is a long-term cause of liver cirrhosis and liver cancer). Reuse of injection equipment without sterilization leads to 8 to 20.6 million cases of new hepatitis B infections, 2.0 to 4.7 million cases of hepatitis C infections and 80 000 to 260 000 cases of HIV infections annually. As a result, there is an estimated loss of between 6.96 million healthy life-years (DALYs) and 26 million life-years (YLL) annually. Unsafe injection practices potentially cost more than $535 million per year in direct medical expenditures. There is currently no international target, but the WHO member states agreed to promote total injection safety. Measures to achieve this include the communication of risks associated with unsafe injections to patients and health care workers, training of health care workers, ensuring access to sufficient quantities and quality of injection equipment in health care facilities, and management of sharps waste. Globally, about one third of adults are regularly exposed to second-hand tobacco smoke. Approximately 700 million children (about 40% of the world's children) regularly breathe air polluted by tobacco smoke. Tobacco is one of the main risk factors for a number of chronic diseases: including cancer, lung diseases, and cardiovascular diseases. Second-hand smoke causes about 600 000 premature deaths per year. There is no global target, but the WHO air quality guideline for particulate air pollutants can also be applied to the indoor environment. Measures include public education, providing smoke-free environments, and – as agreed by all WHO members – protecting people from exposure to tobacco smoke in indoor workplaces, public transport and public areas. Annualy, over the last ten years, disasters with a technological trigger affected 184 000 people and killed 9 767 people, at a cost of about $1.52 billion each year. Safe technologies are, for example, renewable energies, recycling-based economy, and bionics. High risk technologies include: (1) nuclear power, large chemical facilities, and dams (potential for very extensive damage with a very low probability of occurrence), (2) certain genetic engineering applications (potential for very extensive damage but unknown probability), and last but not least, (3) any climate damaging technology. The three most severe accidents caused by these high risk technologies have caused about 32 500 to 442 500 deaths in total. Genetic engineering could lead to antibiotic resistant bacteria, or the creation of new or worse germs. A new epidemic similar to the 1918 Spanish flu could result nowadays in over 100 million deaths and severe economic disruption. Gene transfer by genetically modified crops could also affect population dynamics and biodiversity. The potential effects on human health of the consumption of food produced through genetic modification must be carefully examined. The worldwide cost of decommissioning nuclear power stations is estimated at thousands of billions of dollars. Nanotechnologies need ongoing assessment. However, "new" renewable energy sources (small hydropower, modern biomass, wind, solar, geothermal, and biofuels) have grown to 6% of global final energy consumption, and 18% of world electricity generation. The UN has addressed the transfer of environmentally sound technologies, as well as technological risks from nuclear waste management and biotechnology. Measures consist of: support of research, development and market launch of safe technologies; product labelling; and research, regulation and reduction of technological risks, including the option of prohibition or fade-out of unsafe technologies. Global resource has increased to about 55 billion tonnes per year (minerals, metal ores, fossil energy carriers and biomass). Maintaining or increasing this level of supply beyond the coming decades depends on continued success in exploration and extraction of deposits that are currently uneconomically viable or even undiscovered. There is significant potential for conflicts over natural resources to intensify in the coming decades, and the material flow, energy use and pollution caused by resource extraction will likely rise. Projected onset of maximum oil extraction ranges from 2006 to 2030. Subsequent disruptions in oil supply could cost the US economy alone around $4 trillion, triggering international crises and jeopardizing food security in many less developed countries. There is no international target, but UNEP suggested a long-term reduction of resource consumption by a factor of 10. Proposed approaches are substitution, savings, and resource efficiency: dematerialization, miniaturization, durability, reusing of products respectively components, and recycling of material. From 2000 to 2008, vaccinations against measles reduced the number of deaths from 733 000 to 164 000 (78% decrease). About 83% of the world's children who live in high risk countries received one dose of measles vaccine by their first birthday, through routine health services, in 2008 – up from 72% in 2000. Measles affects about 10 million people, mostly children. This is much fewer than the 27.1 million people in 2004, who lost 14.9 million healthy life-years due to measles. WHO and UNICEF established a global target of reducing measles mortality by 90% of the level in 2000, by 2010. However, experts on global immunization warn of a resurgence in deaths due to measles if vaccination efforts are not sustained. Projections show that without supplementary immunization activities in most affected countries, mortality will quickly rebound: amounting to a projected 1.7 million measles-related deaths in the period of time between 2010 and 2013. Measures consist of routine measles vaccination for children, combined with mass immunization campaigns in countries with high case and death rates; effective surveillance of measles outbreaks; and better treatment of measles. Damage to the ozone layer by fluorinated hydrocarbons has already been considerably reduced by measures undertaken even before the damaging effects could be clearly proven. This is a success story for the application of the precautionary principle. In the Montreal Protocol of 1987, it was agreed to stop production and use of ozone depleting substances (CFCs and FCs) by 2010. This has been achieved to 98%. Without this, atmospheric levels of ozone-depleting substances would grow 10-fold by 2050. The resulting exposure to the sun's ultraviolet radiation (UV) would likely have led to up to 20 million additional cases of skin cancer and 130 million more cases of eye cataracts; it would also have caused damage to human immune systems, wildlife and agriculture. Nevertheless, there are still risks from heightened UV radiation such as skin cancer and cataracts, until the expected recovery of the ozone layer sometime in the mid-21st century. Protective measures still have to tackle problems with regard to some substitutes, CFCs produced and traded illegally, and the management of pre-existing stockpiles. In order to overcome the global challenges, the capacity of individuals and organizations needs to be reinforced. Building the capacity of communities and individuals can contribute to practical progress. Means to accomplish this include: (1) cooperation in partnerships by persons and/or institutions, enterprises or organizations; (2) civic commitments of people or the "corporate citizenship" of enterprises or institutions; (3) options for democratic participation in public affairs, including transparency and good governance. The Agenda 21 and the Millennium Declaration of the United Nations both rely on the principle of cooperation. Partnerships are on the rise, and the number of parliamentary democracies has increased along with the institutional, social and technical possibilities for participation. Good governance stayed constant, or even slightly improved; the perceived level of public-sector corruption has decreased; and the number of companies reporting on their own corporate social responsibility has increased. Getting involved with improving conditions of life is made easier by rules and guarantees that are stipulated in universal, civic, political, economic, social, and cultural human rights. This kind of empowerment can strengthen activities, too. Gender equality, rooted in human rights, is a key to many global challenges. The UN members target to end disparities between boys and girls in all levels of education. There are currently 97 girls for every 100 boys enrolled in primary school, and 96 in secondary school, with an upwards trend. The share of women in parliaments has increased from 12.8% in 1990 to 19.0% in 2010. Nevertheless, this is far from an equal representation, and women are still facing many kinds of discrimination and violence. With regard to political and civic rights in general, the share of world population assessed to be participating in a high level of them has increased in the long-term. Capacity building also includes access to information and education. This enables people in understanding problems and influencing politics and markets on the base of solid information as well as choosing options concerning lifestyles. Furthermore, it assists in creating and accelerating new solutions in research and development and thereby shaping our paths to the future. Agenda 21 and the Millennium Declaration emphasize strengthening education and science along with the role of private business and information technology. The target for 2015 is that all children shall be able to complete primary schooling – in 2008, 89.6% of all children were enrolled in primary school, and 88.1% of those who had started primary school completed their schooling (both increasing). Due to the financial crisis, 350 000 fewer students will complete primary school in 2015. Additionally, the UN has maintained that information and communication technologies shall be available to all. Today, in the Global North 68% have Internet access, whereas in the Global South it is only 15% (both increasing). Patent activity is rising, too. The base year of all target data is 1990, unless otherwise stated. Trends specified by + or − refer to the current direction of development, but not to whether the development is on track to meet a given target. All figures in dollars relate to US dollars. All percentages of world population are taken from the referred source, or in substitution to that calculated from data provided in USCB [United States Census Bureau] 2010, according to the respective year. Almost all available data on global conditions is of low precision. Most data on the largest problems facing mankind are only partially taken from actual measurements of specific cases, more often, estimates are based on modelling and extrapolation. So the data base is far from meeting the motto of the WHO Report 2005: Make every mother and every child count. The impacts on people affected are not primarily caused by the affected individuals, nor can they be minimized solely by them, but rather require outside assistance or larger scale changes in human activities. The challenges are differentiated according to the possible actions or means of addressing them. Being affected by one of the problems covered in the survey is considered to be more severe than only being endangered. According to the data given, the number of people affected is weighted about three times more heavily than data on people who are simply exposed to a problem. If figures on current and future deaths are available, the average is used. Because DALYs include premature death cases, which are already covered, the DALYs are weighted at half the value of reports on deaths. Because there is insufficient data on the affected natural foundations for life, the relative importance of the available data was not recalculated to reach 100%. Therefore, where there is a lack of information on a problem, it was chosen to err on the side of under-representing it, rather than over-representing it. Data on future economic damages are given as net present values or percentage of gross world product, and are therefore comparable to data on current economic damages (which are already given as percentage of gross world product, or calculated into a percentage of current gross world product). Despite all these considerations, it has to be strongly emphasized that due to lack of relevant and reliable data, the resulting order of challenges cannot be considered to be very precise. They are therefore better viewed as groups with high, middle and lower relative priority. Thus, rather than seeing a problem listed as number 5 as definitely more important than one listed in position 6, it is more appropriate to conclude that challenges listed in positions such as 5 and 6 will be more urgent than a challenge listed in position 10. Nevertheless, the real data shows very clear differences between the challenges indicating higher or lower relevance. This is visualized by the small diagrams below each challenge title. For some more details, please refer to the methodology page from the previous draft. Asia Times Online 2003: The death of China's rivers. By Jasper Becker. Hong Kong, August 26, 2003. ASPO 2008 – Association for the Study of Peak Oil & Gas: The General Depletion Picture. In: ASPO Newsletter No. 96, December 2008, p. 2. BGR 2005 – Bundesanstalt für Geowissenschaften und Rohstoffe: Erdöl – Reserven, Ressourcen und Reichweiten – eine Situationsbeschreibung aus Sicht der BGR. Vortrag von Dr. J. Peter Gerling, BGR, anlässlich der DGMK-Frühjahrstagung 2005 in Celle. Birol 2008 – Birol, Fatih (IEA Chief Economist): George Monbiot meets ... Fatih Birol. Video-Interview in The Guardian online, 15 December 2008. Black et al. 2008 – Robert E. Black, Lindsay H. Allen, Zulfiqar A. Bhutta, Laura E. Caulfield, Mercedes de Onis, Majid Ezzati, Colin Mathers and Juan Rivera: Maternal and child undernutrition: global and regional exposures and health consequences. In: The Lancet 2008, 371, 243-60. Brahmbhatt [WB] 2006 – Milan Brahmbhatt: Economic Impacts of Avian Influenza Propagation. [Presentation at the First International Conference on Avian Influenza in Humans, Institut Pasteur, Paris, France, June 29, 2006]. World Bank. CBC 2008 – Canadian Broadcasting Corporation: The world's worst natural disasters; Calamities of the 20th and 21st centuries. May 13, 2008. CBD 2000 – Convention on Biological Diversity: Cartagena Protocol on Biosafety to the Convention on Biological Diversity. CBD 2002 – Convention on Biological Diversity, Conference of the Parties: Strategic Plan for the Convention on Biological Diversity (COP 6 Decision VI/26). CBD 2010 – Secretariat of the Convention on Biological Diversity: Global Biodiversity Outlook 3. (ISBN 92 9225 220 8) Montreal. CDC 2010 – Center for Control and Disease Prevention: In the News; 2010 Measles Update. September 9, 2010. Chernobyl Forum 2006 – The Chernobyl Forum: 2003-2005 (International Atomic Energy Agency [IAEA], the World Health Organization [WHO], the Governments of Belarus, the Russian Federation and Ukraine, etc. ): Chernobyl's Legacy: Health, Environmental and Socio-Economic Impacts, and Recommendations to the Governments of Belarus, the Russian Federation and Ukraine; Second revised version. (IAEA/PI/A.87 Rev.2 / 06-09181) Vienna, April 2006. Christian Aid 2006: The climate of poverty: facts, fears and hope; A Christian Aid report. CorporateRegister.com Ltd. 2010: The CR Reporting Awards – Global Winners & Reporting Trends; April 2010. CSP 2009 – Center for Systemic Peace and Center for Global Policy: Global Report 2009; Conflict, Governance, and State Fragility. DOE 2005 – U. S. Department of Energy: Peaking of World Oil Production: Impacts, Mitigation, & Risk Management. By Robert L. Hirsch, SAIC; Roger Bezdek, MISI; Robert Wendling, MISI. Economist 2008: The Economist Intelligence Unit's Index of Democracy 2008. EIA 2010 – U. S. Energy Information Administration: International Energy Outlook 2010. Washington, D. C.
EK 2002 – Enquete-Kommission "Globalisierung der Weltwirtschaft – Herausforderungen und Antworten": Schlussbericht der Enquete-Kommission Globalisierung der Weltwirtschaft – Herausforderungen und Antworten. Deutscher Bundestag, 14. Wahlperiode: Drucksache 14/9200. Eliasch 2009 – The Eliasch Review: Climate Change; Financing the Global Forests. (ISBN 9780108507632) Richmond. Encyclopædia Britannica Online 2008: Huang He floods. 17 November 2008. EWG 2008 – Energy Watch Group: Zukunft der weltweiten Erdölversorgung; Überarbeitete, deutschsprachige Ausgabe, Mai 2008, mit freundlicher Unterstützung des Club Niederösterreich (www.clubnoe.at). By Jörg Schindler and Werner Zittel. Berlin, May 2008. FAO 2004 – Food and Agriculture Organization of the United Nations: The State of Food Insecurity in the World 2004; Monitoring Progress towards the World Food Summit and Millennium Development Goals. (ISBN 92-5-105178-X) Rome. FAO 2007 – Food and Agriculture Organization of the United Nations: State of Food and Agriculture 2007; Paying Farmers for Environmental Services. FAO Agriculture Series No. 38. (ISBN 0081-4539) Rome. FAO 2008 – Food and Agriculture Organization of the United Nations: Briefing paper: Hunger on the rise; Soaring prices add 75 million people to global hunger rolls. Rome, 17 September 2008. FAO 2008a – Food and Agriculture Organization of the United Nations: Number of hungry people rises to 963 million; High food prices to blame – economic crisis could compound woes. 9 December 2008, Rome. FAO 2009 – Food and Agriculture Organization of the United Nations: The State of Food Insecurity in the World 2009; Economic crises – impacts and lessons learned. (ISBN 978-92-5-106288-3) Rome. FAO 2009a – Food and Agriculture Organization of the United Nations: The State of Food and Agriculture; Livestock in the balance. (ISBN 978-92-5-106215-9) Rome. Freedom House 2010: Freedom in the World – Tables and Graphs. FSF 2008 – Financial Stability Forum: Report of the Financial Stability Forum on Enhancing Market and Institutional Resilience. 7 April 2008. G-20 2008 – Group of Twenty: Declaration; Summit on Financial Markets and the World Economy. [and] Action Plan to Implement Principles for Reform. . Washington, D. C.
G-20 2009 – Group of Twenty: The Global Plan for Recovery and Reform. London. G-20 2009a – Group of Twenty: Leader's Statement: The Pittsburgh Summit. Pittsburgh. G-20 2010 – Group of Twenty: The G-20 Toronto Summit Declaration. Toronto. Garcia/Altieri 2005 – Maria Alice Garcia and Miguel A. Altieri: Transgenic crops: Implications for biodiversity and sustainable agriculture. In: Bulletin of science, technology & society, 25, 335. Abstract. Global Fund 2010 – The Global Fund to Fight AIDS, Tuberculosis and Malaria: Fighting Tuberculosis. Greenpeace 2006: The Chernobyl Catastrophe; Consequences on Human Health. (ISBN 5-94442-013-8) Amsterdam, April 2006. Hooftman et al. 2008 – Daniel A. P. Hooftman, J. Gerard B. Oostermeijer, Elisabeth Marquard and Hans (J.) C. M. den Nijs: Modelling the consequences of crop-wild relative gene flow: A sensitivity analysis of the effects of outcrossing rates and hybrid vigour breakdown in Lactuca. In: Journal of Applied Ecology, 45, 1094-1103. Hutton/Haller (WHO) 2004 Guy Hutton and Laurence Haller: Evaluation of the costs and benefits of water and sanitation improvements at the global level. (WHO/SDE/WSH/04.04) Geneva. IEA 2004 – International Energy Agency: World Energy Outlook 2004; Executive Summary. IEA 2007 – International Energy Agency: Medium-Term Oil Market Report July 2007. IEA 2008 – International Energy Agency: World Energy Outlook 2008; Executive Summary. IHME 2010 – The Institute for Health Metrics and Evaluation, University of Washington: Building Momentum; Global progress toward reducing maternal and child mortality. (ISBN 978-0-9840910-1-0) Seattle. IIF 2008 – Institute of International Finance: Final Report of the IIF Committee on Market Best Practices: Principles of Conduct and Best Practice Recommendations; Financial Services Industry Response to the Market Turmoil of 2007-2008. July 2008. ILO 2005 – International Labour Organization: World Day for Safety and Health at Work 2005: A Background Paper. ILO 2009 – International Labour Organization: World Day for Safety and Health at Work 2009; Facts on safety and health at work. Geneva. ILO 2010a – International Labour Organization: Global Employment Trends. January 2010. IMF 2008 – International Monetary Fund: IMF Sees Global Imbalances Narrowing, But More to Be Done. By Hamid Faruqee, IMF Research Department. February 19, 2008. ISP 2003 – The Independent Science Panel on GM: The Case for a GM-Free Sustainable World. ITDG 2003 – Intermediate Technology Development Group – BBC article by Alex Kirby: Indoor smoke 'kills millions'. November 28, 2003. ITPOES 2010 – Industry Taskforce on Peak Oil & Energy Security: The Oil Crunch; A wake-up call for the UK economy; Second report of the UK Industry Taskforce on Peak Oil & Energy Security (ITPOES). (ISBN: 978-0-9562121-1-5) London. IWMI 2007 – International Water Management Institute: Water for Food, Water for Life: A Comprehensive Assessment of Water Management in Agriculture. Summary. (ISBN 978 1 84407 396 2) London: Earthscan, and Colombo: International Water Management Institute. Johnson 1999 – Brian Johnson: Genetically modified crops and other organisms: Implications for agricultural sustainability and biodiversity. In: Agricultural Biotechnology and the Poor, 1999, 131-138. Kane et al. 1999 – A. Kane, J. Lloyd, M. Zaffran, L. Simonsen and M. Kane: Transmission of hepatitis B, hepatitis C and human immunodeficiency viruses through unsafe injections in the developing world: model-based regional estimates. In: Bulletin of the World Health Organization, 1999, 77 (10), 801-807. Kaufmann et al. (WB) 2009 – Daniel Kaufmann (Brookings Institution), Aart Kraay and Massimo Mastruzzi (The World Bank): Governance Matters VIII: Aggregate and Individual Governance Indicators 1996-2008. (Policy Research Working Paper 4978.) June 2009. Kemfert/Schumacher [DIW] 2005 – Claudia Kemfert and Katja Schumacher: Costs of Inaction and Costs of Action in Climate Protection; Assessment of Costs of Inaction or Delayed Action of Climate Protection and Climate Change; Final Report; Project FKZ 904 41 362 for the Federal Ministry for the Environment. (DIW Berlin: Politikberatung kompakt 13) Berlin, Deutsches Institut für Wirtschaftsforschung, 30 November 2005. Laeven/Valencia (IMF) 2008 – Luc Laeven and Fabian Valencia: Systemic Banking Crises: A New Database. (IMF Working Paper WP/08/224) Authorized for distribution by Stijn Claessens. November 2008. MA 2005 – Millennium Assessment: Ecosystems and Human Well-being; Synthesis; A Report of the Millennium Ecosystem Assessment. (Written on behalf of the UN, coordinated by UNEP.) World Resources Institute. (ISBN 1 59726 040 1) Washington, D. C.
McKeown 2003 – John McKeown: Decommissioning: Lessons To Learn. In: IAEA Bulletin, Volume 45, Issue 1, 24-29. Miller/Pisani 1999 – M. A. Miller and E. Pisani: The cost of unsafe injections. In: Bulletin of the World Health Organization, 1999, 77 (10), 808-811. Montreal Protocol – Secretariat for The Vienna Convention for the Protection of the Ozone Layer & The Montreal Protocol on Substances that Deplete the Ozone Layer, UNEP: The Montreal Protocol on Substances that Deplete the Ozone Layer, as either adjusted and/or amended in London 1990, Copenhagen 1992, Vienna 1995, Montreal 1997, Beijing 1999. (ISBN: 92-807-1888-6) Nairobi, 2000. Munich Re Group 2010: First half of 2010 marked many severe natural catastrophes. Press release, 7 July 2010. NOAA 1999 – National Oceanic and Atmospheric Administration, US Department of Commerce (DOC): NOAA's Top Global Weather, Water and Climate Events of the 20th Century. December 13, 1999. NPT 2010 – Treaty on the Non-Proliferation of Nuclear Weapons: 2010 Review Conference of the Parties to the Treaty on the Non-Proliferation of Nuclear Weapons; Final Document; Volume I. (NPT/CONF.2010/50 (Vol. I) New York. OECD 2008 – Organisation for Economic Co-operation and Development: OECD Environmental Outlook to 2030. (ISBN 978-92-64-04048-9) Paris. Summary in English (pp. 1-14). OECD 2008a – Organisation for Economic Co-operation and Development: OECD Environmental Outlook to 2030; Fig. 8.3: Distribution of the urban population according to estimated annual mean PM10 concentrations in the modelled cities by regional cluster. OECD/JPO/EPO 2008 – Organisation for Economic Co-operation and Development, Patent Office Japan and European Patent Office: Compendium of Patent Statistics 2008. One 2010: HIV/AIDS, Tuberculosis, Malaria Fact Sheet. People's Daily Online 2005: After 30 years, secrets, lessons of China's worst dams burst accident surface. Beijing, October 01, 2005. Pimentel et al. 2001 – David Pimentel, S. McNair, J. Janecka, J. Wightman, C. Simmonds, C. O'Connell, E. Wong, L. Russel, J. Zern, T. Aquino, T. Tsomondo: Economic and environmental threats of alien plant, animal, and microbe invasions. In: Agriculture, Ecosystems and Environment 84 (2001), 1-20. POST 2001 – The Parliamentary Office of Science and Technology: Postnote "Managing Flooding". December 2001, Number 169. London. Prüss-Üstün et al. (WHO) 2008 – Annette Prüss-Üstün, Robert Bos, Fiona Gore and Jamie Bartram: Safer water, better health; Costs, benefits and sustainability of interventions to protect and promote health. (ISBN 978 92 4 159643 5) Geneva. Red Cross 2009 – International Federation of Red Cross and Red Crescent Societies: World Disasters Report 2009; Focus on early warning, early action. Geneva. REN21 2010 – Renewable Energy Policy Network for the 21st Century: Renewables 2010; Global Status Report. Paris. RWI/ISI/BGR 2006 – Rheinisch-Westfälisches Institut für Wirtschaftsforschung (RWI Essen), Fraunhofer-Institut für System- und Innovationsforschung (ISI), Bundesanstalt für Geowissenschaften und Rohstoffe (BGR): Trends der Angebots- und Nachfragesituation bei mineralischen Rohstoffen; Endbericht. SIGN 2010 – Safe Injection Global Network: Annual Meeting of the Safe Injection Global Network; Injection Safety In Light Of Primary Health Care Reforms; 30 November to 2 December 2009; Executive Board Room; World Health Organization Headquarters Geneva Switzerland. Stenberg et al. 2007 – Karin Stenberg, Benjamin Johns, Robert W. Scherpbier, and Tessa Tan-Torres Edejer: A financial road map to scaling up essential child health interventions in 75 countries. In: Bulletin of the World Health Organization 85(4): 305-314, 2007 April. Stern 2006 – Nicholas Stern: The Economics of Climate Change. (Report to the Prime Minister and the Chancellor of the Exchequer of the United Kindom of Great Britain and Northern Ireland.) P. (Pages) i (roman 1)-xxvii (roman 27): Executive Summary ; p. 143-167: Part II: Impacts of climate change on growth and development (Chapters 3-6). Print: Cambridge University Press 2007. Taubenberger/Morens 2005: Jeffery K. Taubenberger and David M. Morens: 1918 Influenza: the Mother of All Pandemics. In: Emerging Infectious Diseases, December 2005. TI 2009 – Transparency International: Corruption Perceptions Index, FAQ: Which countries/territories' scores improved most? TRL 2000 – Transport Research Laboratory: Estimating global road fatalities. By G. Jacobs, A. Aeron-Thomas, A. Astrop. (TRL Report, No. 445) Crowthorne, Transport Research Laboratory, 2000. UKERC 2009 – UK Energy Research Centre: Global Oil Depletion; An assessment of the evidence for a near-term peak in global oil production. (ISBN 1-903144-0-35) London. UN 1992 – United Nations Conference on Environment and Development: Agenda 21. Rio de Janeiro, June 1992. UN 2000 – United Nations, General Assembly: United Nations Millennium Declaration. UN 2002 – United Nations, World Summit on Sustainable Development: Plan of Implementation. UN 2004 – United Nations: A more secure world: Our shared responsibility. Report of the High-level Panel on Threads, Challenges and Change. UN 2004a – United Nations, Department of Economic and Social Affairs, Population division: The Impact of AIDS. UN 2005 – United Nations: The Millennium Development Goals Report 2005. UN 2006 – United Nations, Department of Economic and Social Affairs, and United Nations Conference on Trade and Development: World Economic Situation and Prospects 2006. (ISBN 92-1-109150-0) New York, January 2006. UN 2006a – United Nations: Report of the Secretary-General on the work of the Organization. General Assembly, Official Records, Sixty-first Session, Supplement No. 1 (A/61/1). UN 2010 – United Nations: The Millennium Development Goals Report 2010. [Published by the United Nations Department of Economic and Social Affairs DESA – June 2010.] (ISBN 978-92-1-101218-7) New York. UN 2010a – United Nations: The Millennium Development Goals Report 2010. [Statistical Annex]. UN 2010b – United Nations: World Economic Situation and Prospects 2010. UNAIDS 2007 – Joint United Nations Programme on HIV/AIDS: 2008 Report on the global AIDS epidemic. December 2007. UNAIDS/WHO 2009 – Joint United Nations Programme on HIV/AIDS and World Health Organization: AIDS epidemic update; December 2009. Geneva. UNCCD 1994 – United Nations Convention to Combat Desertification: United Nations Convention to Combat Desertification in Those Countries Experiencing Serious Drought and/or Desertification, Particularly in Africa. UN General Assembly, A/AC.241/27. UNDP 2007 – United Nations Development Programme: Human Development Report 2007/2008; Fighting climate change: Human solidarity in a divided world. UNEP 1999 – United Nations Environment Programme: Global Environment Outlook 2000 (GEO 2000); Overview. UNEP 2007 – United Nations Environment Programme: Global Environment Outlook 4; Environment for Development. (ISBN 978-92-807-2836-1) Nairobi. UNEP 2009 – United Nations Environment Programme: Climate Change Science Compendium 2009. UNEP 2009a – United Nations Environment Programme: From Conflict to Peacebuilding; The Role of Natural Resources and the Environment. (ISBN: 978-92-807-2957-3) Nairobi. UNFCCC 2008 – United Nations Framework Convention on Climate Change: UNFCCC fact sheet on 1990-2006 emission trends. UNFF 2006 – United Nations Forum on Forests: Report of the sixth session. Economic and Social Council, Official Records 2006 Supplement No. 22. (ISSN 1728-0095) New York. UNICEF 2008 – United Nations Children's Fund: Releasing Declining Numbers for Child Mortality; UNICEF Calls for Increased Efforts to Save Children's Lives. Press release, 12 September 2008. UNICEF 2009 – United Nations Children's Fund: The State of The World's Children 2009; Maternal and Newborn Health. UN Water/GWP 2007 – UN Water and Global Water Partnership: Roadmapping for Advancing Integrated Water Resources Management (IWRM) Processes. USCB 2010 – U. S. Census Bureau, Population Division: Total Midyear Population for the World: 1950-2050. June 28, 2010. WB 2006 – World Bank: Avian Flu; Economic Impacts. June 29, 2006. WB 2006b – World Bank: Strengthening Forest Law Enforcement and Governance; Addressing a Systemic Constraint to Sustainable Development. Sustainable Development Network (Report No. 36638-GLB) Washington, D. C.
WB 2007 – World Bank: World Development Indicators 2007; Section 4: Economy. WB 2007a – World Bank: IDA at Work: Water Resources; Improving Services for the Poor. WB 2008 – World Bank: The Developing World Is Poorer Than We Thought, But No Less Successful in the Fight against Poverty. By Shaohua Chen and Martin Ravallion (World Bank Policy Research Working Paper 4703, August 2008). WB 2008b – World Bank: Double Jeopardy: Responding to High Food and Fuel Prices. July 2, 2008 (G8 Hokkaido-Toyako Summit). WB 2009 – World Bank: The Sunken Billions; The Economic Justification for Fisheries Reform. (ISBN 978 0 8213 7790 1) Washington, D. C.
WB 2010 – World Bank: Global Monitoring Report 2010; The MDGs after the Crisis. (ISBN 978-0-8213-8316-2) Washington, D. C.
WFP 2004 – World Food Programme: Jahresbericht 2004.
WHO 2002 – World Health Organization: The World Health Report 2002 – Reducing Risks, Promoting Healthy Life. (ISBN 1020-3311) Geneva. WHO 2003 – World Health Organization: WHO Framework Convention on Tobacco Control. (ISBN 978 92 4 159101 0) Geneva. WHO 2004a – World Health Organization: World report on road traffic injury prevention; Summary. (ISBN 92 4 159131 5) Geneva. WHO 2005 – World Health Organization: The World Health Report 2005 – Make every mother and child count. (ISBN 1020-3311) Geneva. WHO 2006 – World Health Organization: WHO Air quality guidelines for particulate matter, ozone, nitrogen dioxide and sulfur dioxide; Global update 2005; Summary of risk assessment. (ISBN 978 92 4 159480 6) Geneva. WHO 2006a – World Health Organization: Evaluation of the costs and benefits of household energy and health interventions at global and regional levels; Summary. (ISBN 978 92 4 159480 6) Geneva. WHO 2007 – World Health Organization: Protection from exposure to second-hand tobacco smoke; Policy recommendations. (ISBN 978 92 4 156341 3) Geneva. WHO 2008 – World Health Organization: World Health Statistics 2008. (ISBN 978 92 4 0682740) Geneva. WHO 2009 – World Health Organization: Global Health Risks; Mortality and burden of disease attributable to selected major risks. (ISBN 978 92 4 156387 1) Geneva. WHO 2009a – World Health Organization: Global Tuberculosis Control; A short update to the 2009 report. (ISBN 978 92 4 159886 6) Geneva. WHO 2009b – World Health Organization: World malaria report 2009.
WHO 2009e – World Health Organization: Global status report on road safety; Time for Action. WHO 2009f – World Health Organization: WHO Report on the Global Tobacco Epidemic; Implementing smoke-free environments. WHO 2009g – World Health Organization: First Global Ministerial Conference on Road Safety: Time for Action; Moscow Declaration. WHO 2010 – World Health Organization, 63rd World Health Assembly: Resolutions, WHA63.18 Viral hepatitis. WHO/UNICEF 2005 – World Health Organization and United Nations Children&s Fund: GIVS; Global Immunization Vision and Strategy 2006-2015. Geneva, New York. WHO/UNICEF 2010 – World Health Organization and United Nations Children&s Fund: Progress on Sanitation and Drinking-water; 2010 Update. (ISBN 978 92 4 156395 6) Geneva. WHO/UNICEF 2010a – World Health Organization and United Nations Children's Fund: Joint Annual Measles Report 2009; Strengthening Immunization Services through Measles Control. March 2010. WIPO 2010 – World Intellectual Property Organization: World Intellectual Property Indicators 2010. (ISBN 978-92-805-1978-5) Geneva. WWC 2009 – World Water Council: Global Water Frameworks Outcomes of the 5th World Water Forum, Istanbul 2009.